…..and while it is nowhere near as noble as Dr Martin Luther King’s, it is still a dream. And that, all mine. 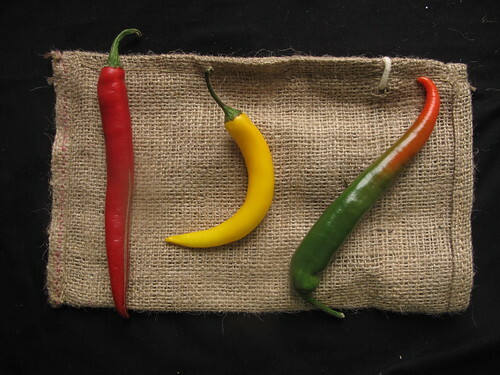 I have a dream that I will make chile sauces and pastes, extolling their values and sharing their colourful faces and facets with men and women all over the world. I have a dream that people in this world will embrace the chile pepper as they have Ice cream. 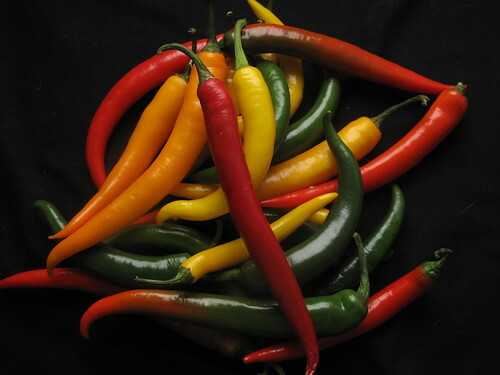 That rather than write it off as being too ‘hot’ , they will be inspired to try different blends and varieties and find themselves endeared by the nuances of them all, from chipoltes to anchos, birds eyes and Madame Jeanettes, Purple, red, green, blue and brown. 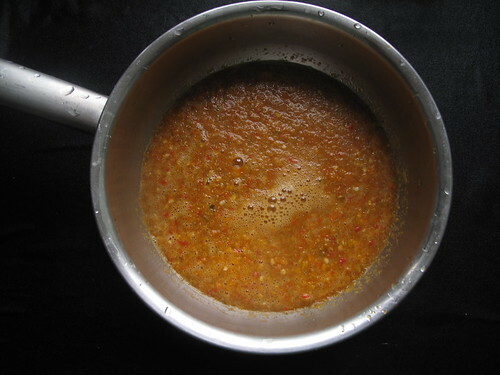 At the point I dreamt these dreams, I had come to the end of a 3rd jar of yellow pepper sauce – blended with red onions, fried in oil and seasoned with Maggi sauce with a dab hand and a pinch of salt. The consistency in all three jars gave me hope that this could be marketable, as did the comments from friends. And so I’ve stashed that one away as one for ‘old age’, my retirement cottage industry. And then we arrived at Thailand with Joan of Foodalogue and her 2011 Culinary tour and suddenly the future looked bright and orange and traditional. Sriracha. Sriracha is one Thai sauce I haven’t yet tasted even if I am a Thai lover. I was first introduced to Thai curries through a friend and neighbour when we lived in Nigeria. She had been to the UK and returned with a small collection of the Australian Women Weekly cookbooks. One of them was on Thai cooking. 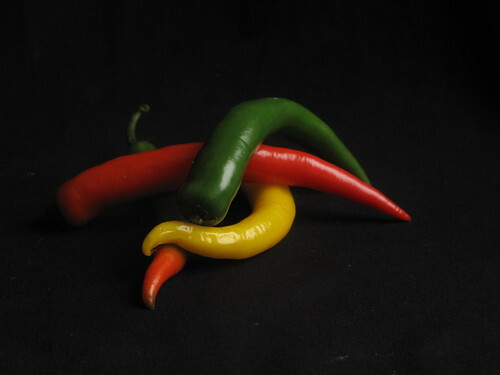 Before you could say ‘A’, my friend and I joined forces and began making curry pastes – green, red and yellow, adapting them and using whatever ingredients we could fine. So when a recipe called for galingale, we subbed ginger…and used a bit less, we were young and free, unfettered and daring to experiment. 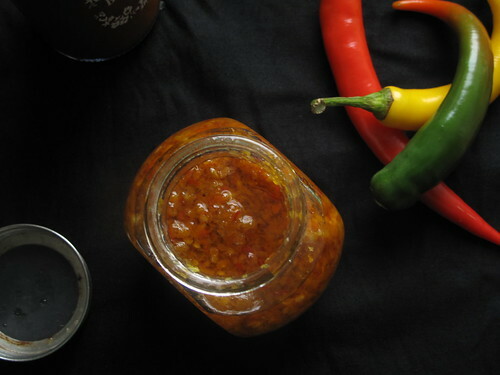 And then we began collecting jam jars so we could have a curry paste making session with our friends which went extremely well – we shared recipes amongst 8 of us and to this day I make Thai curry paste at least once a year. Dreams…..(she says shaking her head to bring her back to reality). Dreams though that have turned into reality for Randy Clemens, the author of the Sriracha Cookbook, and now for me. It was Edamame’s Sriracha recipe on food 52 which awakened me to a culinary icon – the Thai chilli sauce, also popular in Vietnam, Taiwan and other parts of Asia. There was something seductive about the bright orange sauce and talk of balanced sweetness that making the decision was easy. 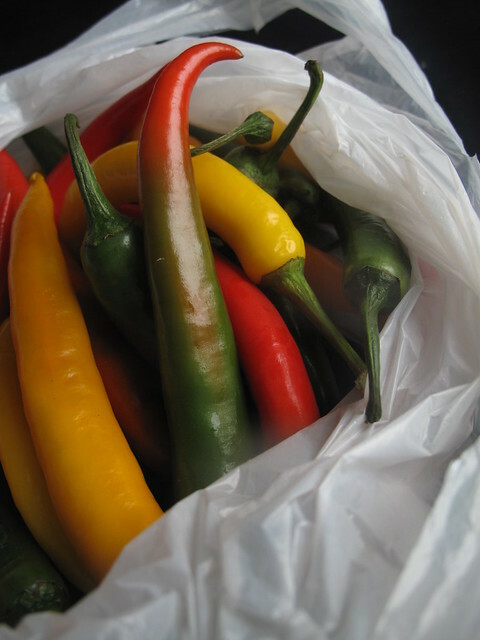 That and the beautiful mixed chile peppers I saw at ‘my’ Turkish shop – peppers I could not resist and which lead me to great discoveries! Look closely and you can still see Sri Racha’s fishing village roots in the labyrinth of rickety piers and pontoons affixed to its waterfront. While modern Thailand encroaches with a jumble of billboards and traffic lights, down on the seafront glimpses of old Siam linger in the restaurants, simple hotels and markets perched above the tide. Hell-for-leather buses are replaced by puttering fishing boats, and locals sit on their decks mending fishing nets in a tropical twilight. Ships waiting to dock at Sri Racha’s modern port stud the near horizon, but they’re far enough away not to spoil the illusion of days gone by. So where does this sauce come from? Sri Racha is home to the famous náam phrík sii raachaa (spicy sauce), a perfect complement to the town’s excellent seafood. 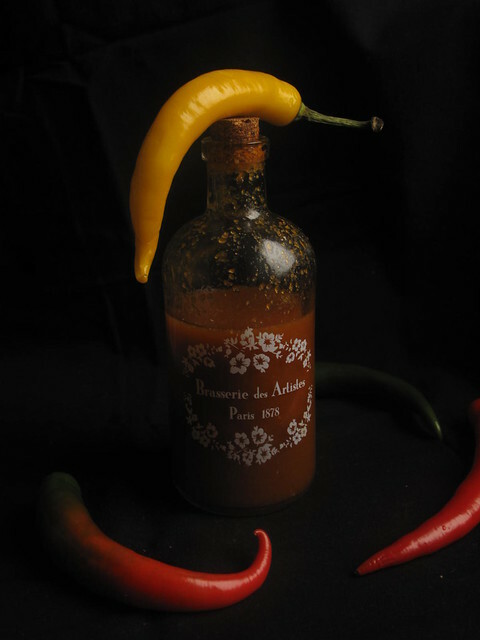 And it is interesting that this sauce is named after a place, just like Piment d’espelette is named after a smoky, hot powder found in the Espelette region of the Pyrenees. What is it and hot sauces being named after places? 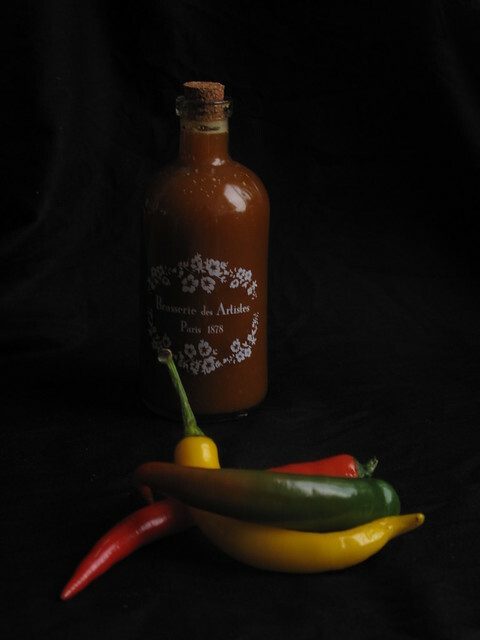 No one would dare call any sauce that came out of New York, NYC hot sauce, or that from France’s chic capital Parisien chile sauce. Doesn’t have quite the same ring to it now, does it? When I consulted N, my Thai friend, she was intrigued by my desire to make ‘Sree-ra-cha’, as it is pronounced; the Sree like in Sri Lanka. I was glad she helped me with the pronunciation as I had no clue. She shared with me Sriracha’s status as a dipping sauce, and occasionally as hot sauce. Andrea Lynn, senior editor for the Chile Pepper magazine says of her Sriracha making adventures on Serious Eats ‘While I opted for red jalapenos with a few Thai chiles thrown in for a notch more of heat, other chiles that can be used include Fresno, Cayenne, Holland, Red Serrano or Chile de Arbol. 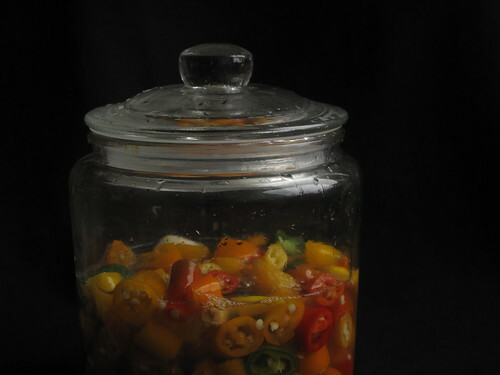 According to the oh-so-informative Viet World Kitchen blog, who used Robert Danhi‘s Sriracha recipe, the chile stems should be snipped but with the crown remaining. 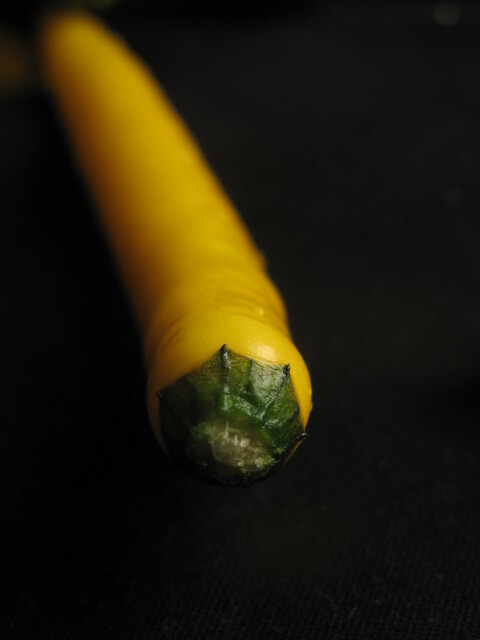 This adds a floral component to the sauce………. 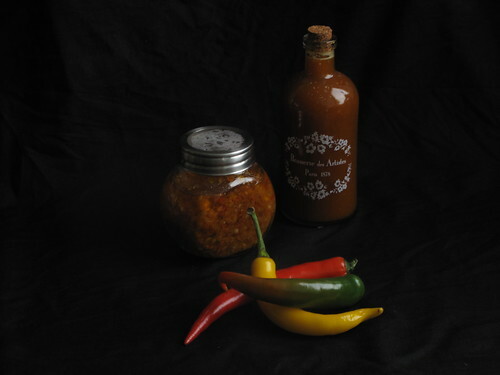 A few recipes also called for a dabble of fish sauce, which I added for a more complex saltiness. And then I proceeded to put all this newly acquired knowledge to bear. 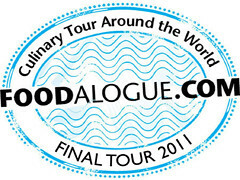 In making a dream….come true. I call it Rainbow Sriracha because of the multitude of colours of chiles that went in. 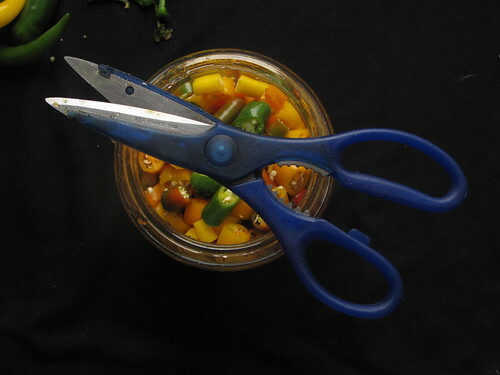 To chop the chiles, employ the services of your kitchen scissors and roughly snip. See the ‘crown’? Leave him be…some say. I did. 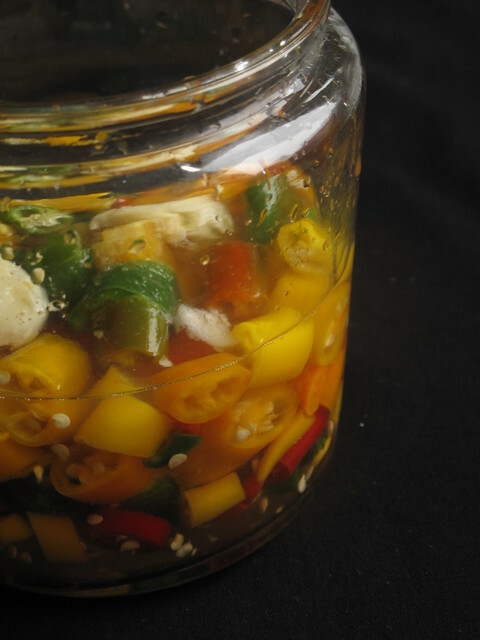 Place all the ingredients except the sugar in a jar and let sit overnight to mellow the heat of the peppers, a sort of brine. I didn’t read this line and added the sugar to the mix…..sigh. Thankfully it had no adverse effects on the results. Place the mixture and sugar in small saucepan. Bring to a boil over high heat, then lower the heat and simmer for 5 minutes, or longer if you’d like a thicker sauce. Remove from heat and set aside to cool to room temperature. 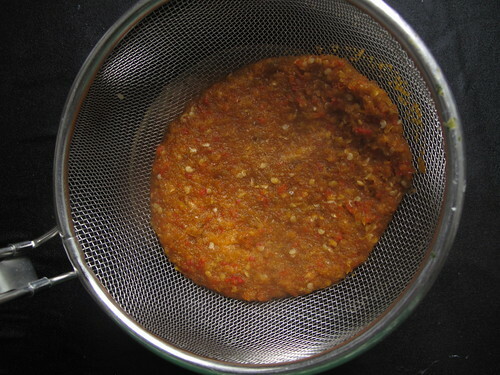 Transfer to a blender and puree for about 5 minutes, until a smooth, orange-red mixture forms. Run through a strainer and smush out as much juice as possible. Apparently, smush is an official word! Let the flavor develop and bloom for a few hours before using, then taste it and adjust with salt, sugar, fish sauce or vinegar. Bottle/put the juice in a jar and use within 30 days. What to do with the left over chile mush once the orange gold is extracted? Well, I followed a suggestion on food52 to ‘save the part that you strain out because it looks and tastes like the Thai chile paste I use’. I heated up some oil and ‘fried’ the chile paste. Then I stored it in a jar….nothing wasted. I can tell you it has been a FANTASTIC addition to everything from coriander chutney to steamed pork buns (more on those soon), eggs, rice and lots more. Now that’s what I call ‘Two for the price of one’. 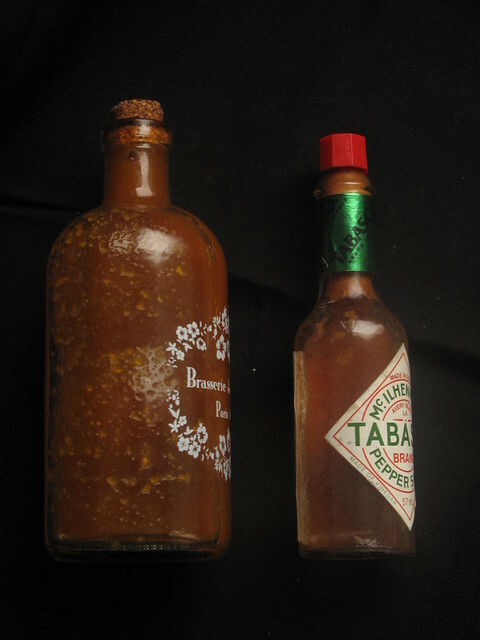 Very similar to Tabasco in colour and consistency, I’m glad I’ve figured out how the great hot sauces are made. 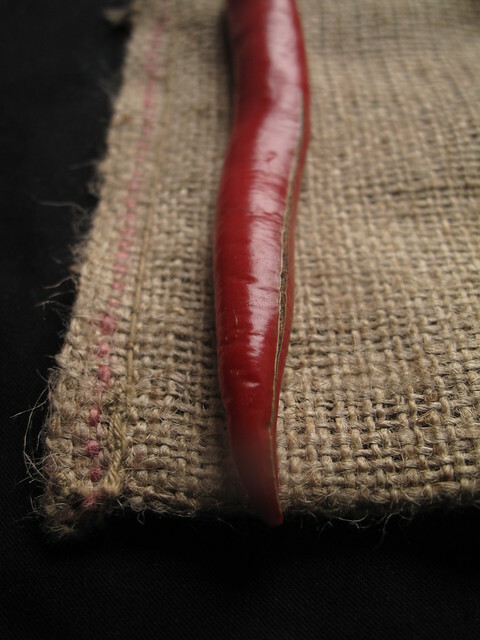 The flavour is sweet, softly sour, extremely fruity, like flower blossoms or fruit pulp was pureed and then made hot. I love the slight sweetness that hits you when you first taste a bit, and how that mellows into a warm, cloud of heat that spreads inside, welcoming and pleasing. 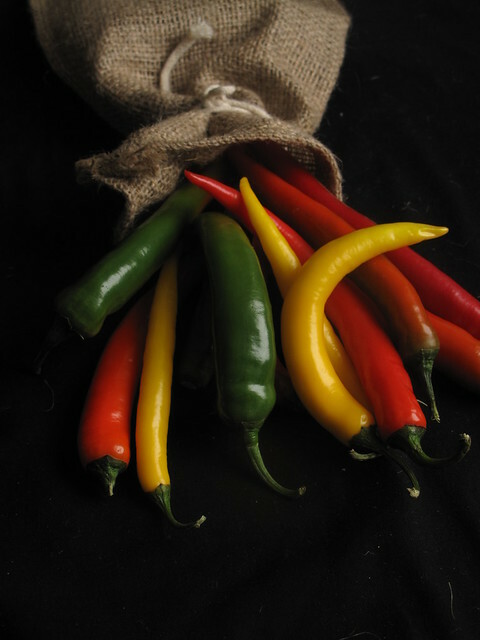 I am so excited that I can now add 2 recipes to my chile book :-), please share your favourite chile recipes with me if you have any. Take care and see you soon. Check out Joan’s round up on Wednesday this week to see what other bloggers brought to the party.